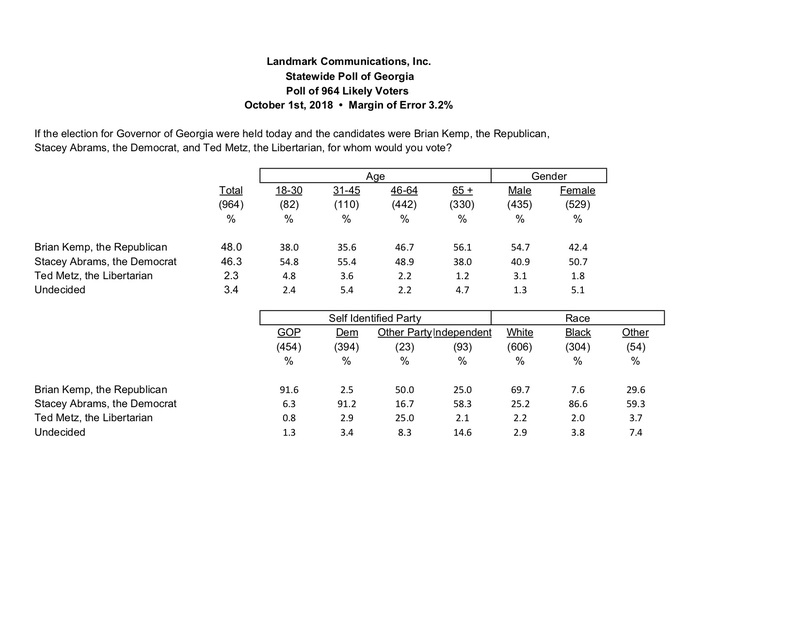 (ATLANTA)–Landmark Communications, Inc. released our latest poll of the Georgia election on Monday for Governor and Lt. Governor, as well as our poll of support and opposition of the Brett Kavanaugh nomination to the United States Supreme Court. Republican Brian Kemp currently leads Democrat Stacey Abrams in the race for Governor by a margin of 48-46%. Libertarian Ted Metz earns 2% of the vote, while 3% of Georgians say they are undecided. In the race for Lieutenant Governor, Republican Geoff Duncan leads Democrat Sarah Riggs Amico by a margin of 48-46%. THE IMPACT OF THE KAVANAUGH NOMINATION—SO FAR…. 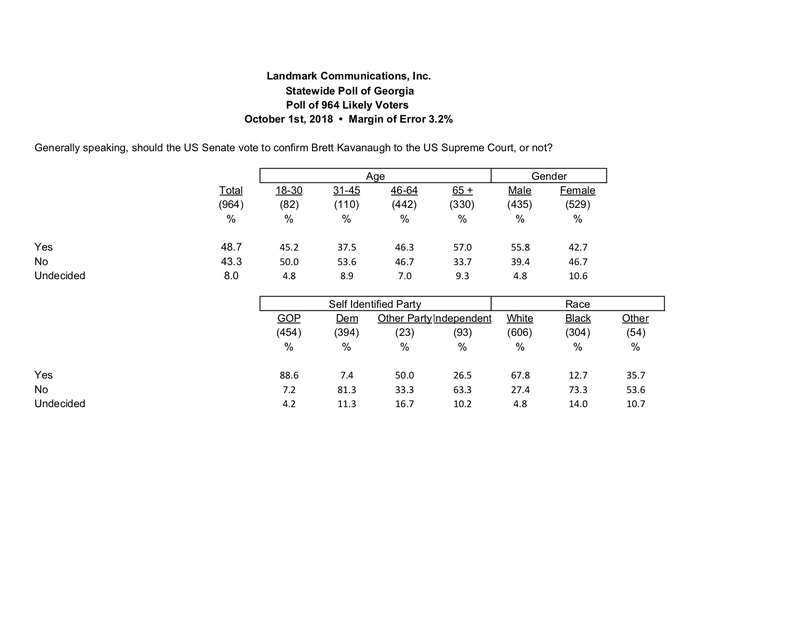 Georgians currently support the nomination of Brett Kavanaugh to the United States Supreme Court by a margin of 49-43%, with 43% of women supporting and 47% opposing, with 11% undecided. Men support the nomination by a very strong margin, 56-39%. “Nearly 90% of Republicans supporting with nearly 90% of Democrats opposing,” said Rountree. 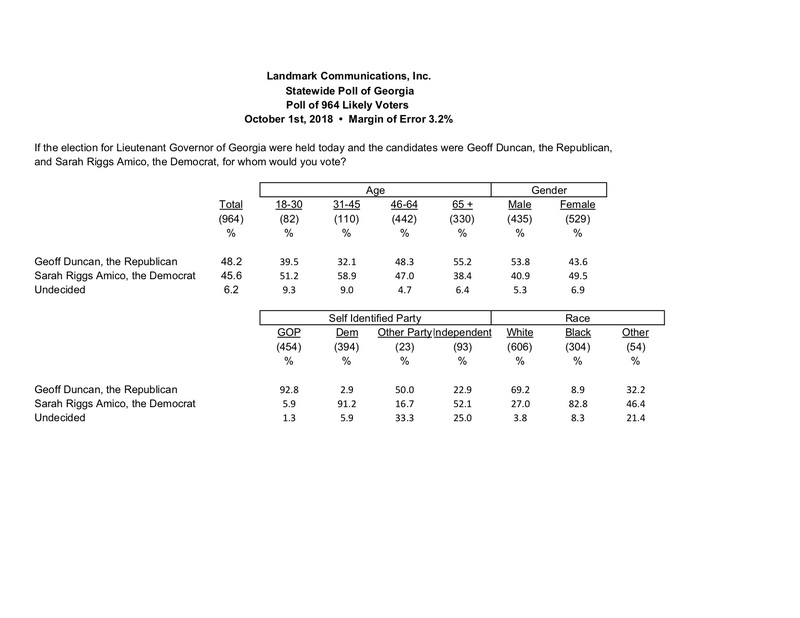 Landmark Communications, Inc. conducted the survey of 964 likely Georgia voters on October 1, 2018. Landmark regularly releases surveys of Georgia politics and campaigns, and funded this survey itself. No candidate, entity or organization had previous knowledge or input for the poll in any way. The margin of error of the survey is 3.2%, and was weighted by age, race and gender to match the projected demographic turnout of the 2018 general election in Georgia. Landmark Communications, Inc. has been polling Georgia voters since 1995. Landmark regularly surveyed the 2014 gubernatorial election, and was noted for being the most accurate polling firm. Landmark polls identified Governor Deal defeating Senator Jason Carter by a 51-45% margin with 2 for the Libertarian candidate, with the final election result at 53-45%, and 3 for the Libertarian.